Sewing with knits can be a daunting experience for someone who is new to them, but it doesn't have to be. As someone who took the plunge as a seamstress awhile ago, I recently acquired a new appreciation for working with knits as a designer. 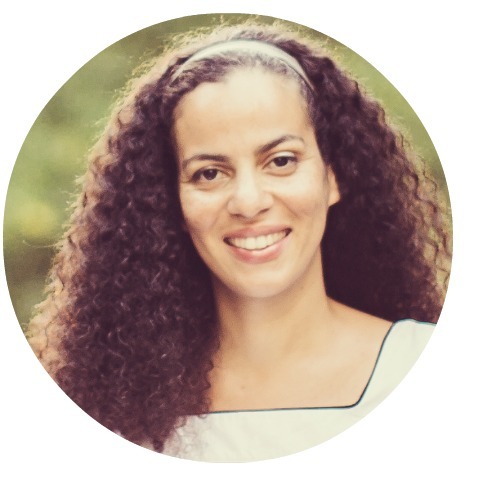 Knowledge is key, so before my first knit pattern is released this week, I wanted to share a little bit about my experience of designing a knit pattern. There is a lot to consider when sewing with knits: types of knits, sergers vs. sewing machines, types of needles, stretch percentage, stretch recovery, cutting knit fabric, etc. I'm going to be focusing mostly on stretch percentage and recovery and will provide links to some great resources that cover the other topics. To be honest, when I've sewn with knits in the past, I never paid too much attention to stretch percentage and recovery, I just sewed with fabrics that I liked. The results were overall quite satisfying, although there were a few patterns that caused me to think "Oooo, the size is a bit off on this one.". Never before did I have the eye opening experience that I had last week when I sewed two samples of the same pattern. 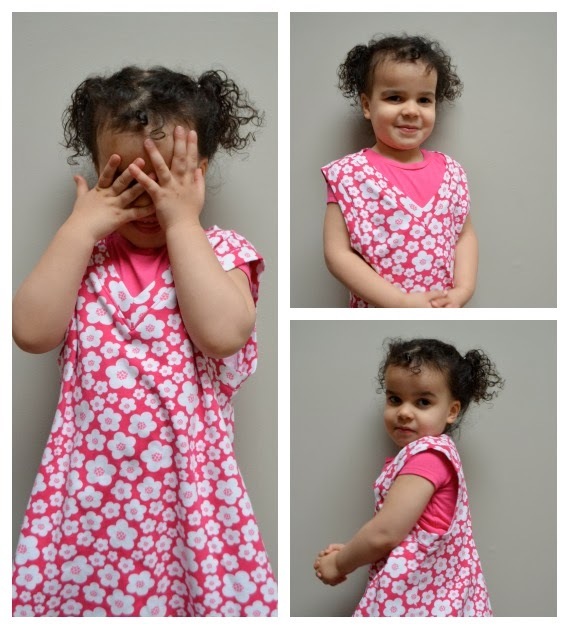 A very wonderful group of testers had been sewing up my Stellar's Vest pattern, and sending me their results. Through no fault of their own, the results came back ranging from perfect sizing, to very large. How was this happening, when they were using the same pattern and even the same size? I adjusted the sizes in the pattern, and had another set of testers do a second round of testing. The results were better, but still inconsistent. I figured I had better sew up a couple more samples of my own. 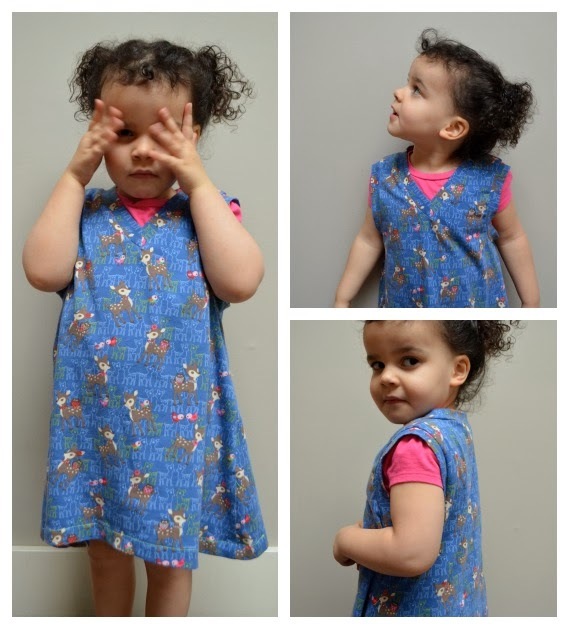 I sewed Anja a size three Stellar's Vest in the A-line version with some adorable fabric from L'Oiseau called Deerly Beloved. (Side note - I highly recommend everything at L'Oiseau. The quality and service is absolutely impeccable.) Ok, back to my experience. The vest turned out great…the fit was perfect in the chest, armholes were good, everything about it was comfortable and cute. She wore it immediately and wouldn't take it off until bedtime. What changed? Did my daughter mysteriously shrink from one day to the next? HA, of course, not! :) But the second garment is a full two sizes too big! This is when I realized the importance of not 'winging' the use of my knit fabric. I should've known better, I admit it. But here's the positive that comes out of this experience: I'm hoping to prevent you from making my mistake! The first fabric had a stretch percentage of over 50% and excellent recovery, while the second, around 25% with good recovery. How can you tell with your fabrics? Cut a 4"X4"(10cmX10cm) piece of fabric, fold it perpendicular with the grain line. 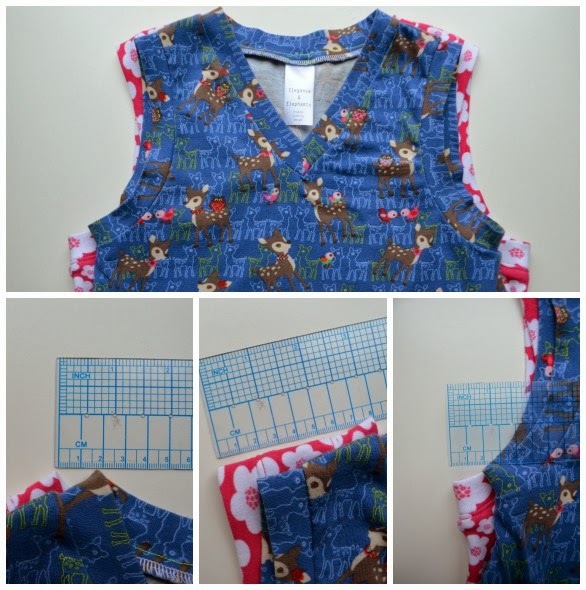 Download and print this stretch percentage guide with tips for sewing with knits, hold the fabric firmly at zero, and stretch it as far as you can. Alternatively, you can use a ruler using the same principle. Either way, just make sure you do this. It makes a world of difference! So now that you know how to determine the stretch percentage, how do you use this valuable information? Well, always read your patterns carefully and only use the fabric type and stretch percentage recommended by the designer. If the pattern does not specify, contact the designer and ask, if possible. Or, don't use your best fabric the first time around. 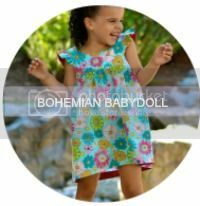 You can size up or down depending on the result of your first garment. 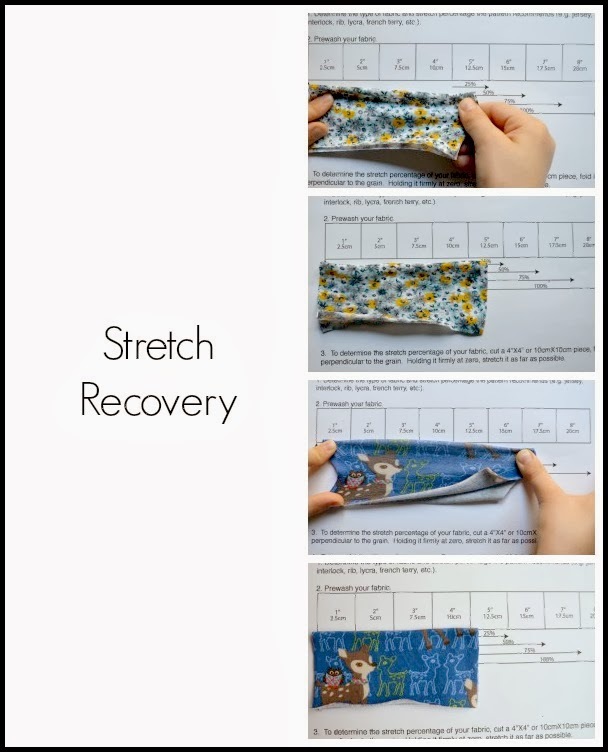 Stretch recovery is also very important to consider when sewing with knits. When you stretch your fabric, does it return to its original size and shape? Or is it now a little wider than it was before? You definitely want to use fabric that has a very good recovery. This recovery corresponds with the quality of the fabric, after all, who wants to wear a garment that becomes wider each time it's worn? I also prefer my knit fabrics to have some weight and/or a bit of lycra to give them that extra bit of recovery and avoid flimsy, lightweight or sheer knits. Of course, this all depends on the pattern you are using, so keep that in mind as well. In the photos below, it's clear to see which fabric has better recovery. The top one basically stayed the same width after it was stretched, while the second one returned to its original size. You can also feel a big difference between the two; the top one has a slightly, rough texture, and the bottom is soft and smooth. What I failed to do for my testers, was specify the stretch percentage and recovery needed to achieve the best results with my pattern. Incidentally, the fabrics of all my samples had a stretch percentage 50% or more and very good to excellent recovery until the final floral one. So, I think a logical explanation is that stretch percentage and recovery played a pretty major part in the varied results (especially after the first round of testing). Lesson learned! Use a stretch or ballpoint needle. The rounded tip passes easily between the knit threads by separating them. Press often. When you sew a seam, and it looks wavy, giving it a good press will more than likely fix the problem. Do not pull or stretch the fabric as you sew. This can create those very wavy seams. There is a time and place for stretching, such as when attaching bindings. Follow the directions in your pattern carefully. I'm so glad to have had this experience so I can pass on what I've learned. 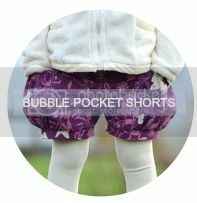 Knits can be so fun to work with and great for children's clothing because they can be so comfortable and versatile, but it really helps to know how to use them properly. I can't stress enough how important it is to read through your patterns so you can achieve the results the designer intends for you to have. Never again will I blindly use knit fabric simply on account of the colour or pattern. It's worth the time to test out the fabric first so that you can be happier with the results. If you have any tips or tricks that help you have success with knits, please leave a comment and let us know. Thanks! 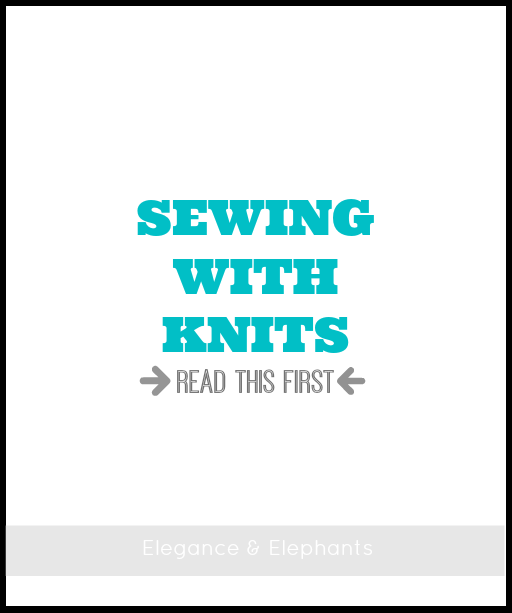 25 comments on "Sewing With Knits - Read this First"
Excellent post:) I had wonderful results in the first round of testing-.im glad I chose a double knit :) this is a great resource for sewing with knits, and your stretch percentage guide is brilliant! You did have awesome results, Amy! Thank you so much! Great information - my two cents is that if you've purchased a knit you love with not great stretch recovery, you can generally use it in a pattern designed for wovens. That's a great point, Janice. Thank you for sharing it. Thank you, Terri! And thanks for all your input and testing! great post!!!! Even those of us who have sewn for a while or sew all the time need these reminders!!! Thank you for this post! I never knew how to check the stretch, now I do!! I'm so glad you did this post! So, so, so glad! Beautifully illustrated, clearly explained and so informative. Thank you, Heidi. Thank you for this informative clear and concise information. I am eager to sew my first true knit project and this will be a big help. Good information to know. I have been sewing most of my life and I have avoided knits like the plague. I have sewn with them a few times, but I usually wind up frustrated with them. Many thanks for sharing this info. It makes sense now why using the same knit pattern I have had different results. This is very useful information. Thanks! I'm really surprised by the result. I've had the same experience with knit garments as well however, mine was the opposite of yours. I made a princess seamed top with a mercerised cotton knit (no stretch) and a high stretch with good recovery knit. The mercerised cotton top fitted perfectly. No changes to the pattern and the high stretch fabric was enormous on me. I considered the next time I make this pattern to go down a size if I use a high stretch fabric. I'll have to re-think this idea.